The Embryology Facility, where In Vitro Fertilization and initial steps of human embryo development takes place, is a central component of Assited Reproduction. Furthermore, the complexity of the procedures requires an ever increasing level of competency. Therefore, it is essential that the Embryology Facility is staffed with a sufficient number of qualified individuals. Several years ago ASRM published staffing guidelines for Embryology Facility. NOTE. This staffing recemmendation is only for Embryology Services and does not include any other services, such as andrology or hormonal assays. Since then, new techniques such as blastocyst culture, trophoectoderm biopsy, embryo and oocyte vitrification have become commonplace. These procedures require more hands-on time and expertise, therefore it is likely that 2008 staffing recommendations no longer reflect the true needs of Embryology Practice and may have to be revised to maintain the necessary level of quality and safety in the Embryology Facility. 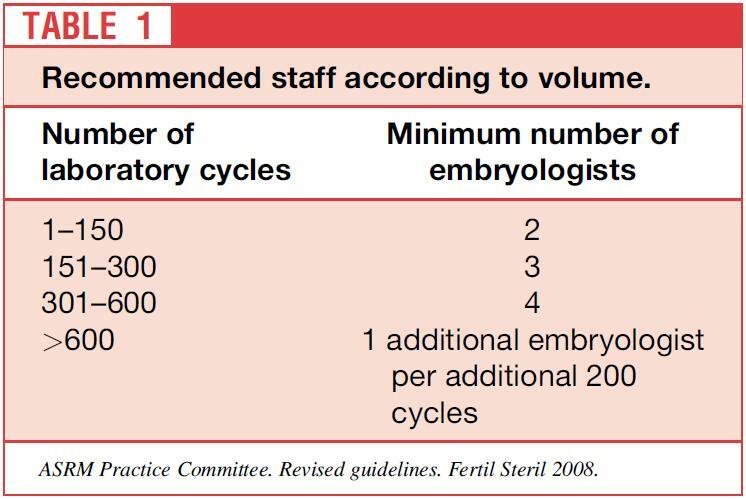 Also, Embryology Practice staffing cannot be based solely on an average number of cases per day. Instead, it also need to take into account for a maximum number of cases that may occur on a single day; those are the days when the chance of errors is increased and the quality of care is most likely to be affected. Yet, EMBCOL became aware that there are clinics that may be taking advantage of the voluntary nature of compliance which may negatively impact the quality of embryology care and/or unjustifiably increase the stress level of embryology practitioners. In order to asses the current staffing levels in Embryology Facilities and as a part of "Know Thy Embryologist" campaign, EMBCOL Practice Committee is conducting a survey of Embryology Facilities in the United States. Based on the survey results, EMBCOL Practice Committee will create a profile of each individual Embryology Facility. Those profiles will be promoted through various sources to help patients choose the clinic with Embryology Facility, which meets or exceeds ASRM recommendations. Please take a moment to complete a survey about your clnic. The deadline to complete this survey is April 30th.